In climates with a freezing winter, our Habitat Flower Garden mixtures can be planted in the spring after the danger of frost has passed. The latest spring planting date would be approximately mid to late June, depending on the date of first frost. Or you may also plant in the fall, as long as soil temperatures are cool enough to prevent early germination. Generally this would be mid-October. Select a site with full sunlight exposure for the best success. Choose a relatively weed-free site (including lawn with sod removed). Areas that contain strong weed populations and/or have soil erosion problems can be used but more extensive site preparation will be necessary. Prepare the soil well because seed-to-soil contact is vital for seed germination and for the healthy rooting of seedlings. Proper preparation also prevents dormant weed seeds (present in topsoil) from becoming a further problem. LIGHTLY scratch (scarify) or roughen the soil surface. 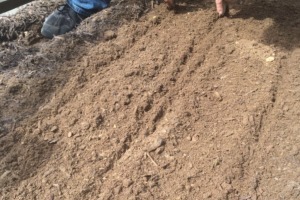 Unless the site is heavily compacted, do NOT till the soil deeply, because: 1) deep tilling promotes the germination of weed seeds already present deeper down and 2) in arid climates, deep tilling disturbs the upward movement of moisture through the soil, thereby lowering the moisture-holding capacity of the soil. To prepare small areas, remove existing weeds with a sharp hoe or mower, then follow with very shallow roto-tilling or simply hand raking. Water the area 2 or 3 times each day over a two- to three-week period to encourage dormant weed seed germination. After 2-3 weeks, when this second crop of weeds is up, mow or scrape the new weeds off at ground level. Again: do not roto-till or roughen the soil at this point. Our Habitat Garden will do best in soils of low to medium fertility. Go easy on fertilizing -- high nitrogen soils only encourage the growth of weeds and lush vegetative plant growth at the expense of flowers. However, if your site consists of subsoil which has shown poor results in past attempts with flowers, consider a soil test to determine exactly what nutrients might be needed and how much. Because our Habitat Flower Gardens contain seeds of vastly different sizes and are often difficult to broadcast, blend an inert carrier such as fine dry sand with the seed to insure even distribution. Use a ratio of 10:1 (sand to seed). Increase the seeding rate 50-100% for "difficult" sites such as those without supplemental water, strong weed populations, or sites with erosion problems. For small areas, hand broadcasting the seed along with the inert carrier like sand works quite well. Also helpful in distributing the seed uniformly, especially over areas greater than 20 square feet, is to draw lines on the ground to divide the area into equal, manageable portions. Then divide the seed/sand mix into the same number of portions. Another trick to divide the amount of seed\sand mix in half and try to spread evenly over the whole area, then do the same with the next half. Once the seed mix has been sown, it should be covered to a maximum depth of no more than 1/8 to 1/4 of an inch. Lightly rake the seed in with a hand rake for small areas. Care must be taken not to cover the seeds too deeply as this is one of the primary causes for failure. Where possible, roll the area with a sod roller to guarantee seeds make firm contact with soil. Keep the planting moist for 4-6 weeks, using supplemental irrigation if necessary in order to ensure germination of as many species as possible. In hot, dry weather, you may have to water 2-4 times per day with light sprinklings. As the planting becomes established, gradually reduce the frequency of supplemental watering. You should begin to see seedlings within 2 weeks and the first flowers in 6-8 weeks. As the season progresses, several waves of color will be seen according to the blooming times of the species contained in the mix. In dry climates or in drought conditions, 1/2 inch of supplemental irrigation per week will lengthen the blooming period of the flower display. You may want to mow the area in the fall (summer in the deep South and West) to a height of 4-6", after most of the flowers have finished blooming and set seed. Mowing will help to scatter the ripe seeds for next year's showing. The following spring (or fall), also consider supplementing the site with some new seed in order to more firmly establish the permanence of the planting and to suppress weed growth.